50% Commission - Earn $100 per sale PLUS lifetime residual commission! 50% commission on the initial sale of $200, plus 50% commission on the $75 monthly picks delivery subscription payment for the lifetime of the customer. Promoting DemolisherBettingSystem.com can provide you with a substantial source of income! All you have to do is put a link to www.DemolisherBettingSystem.com on your website with the special affiliate URL that Clickbank supplies (read more about Clickbank below). Get paid every week - the affiliate program is run by Clickbank®, the most trusted 3rd party affiliate program on the internet! Join my Demolisher Betting System Affiliates Newsletter Below! If you're interested in making cash by referring customers to DemolisherBettingSystem.com, sign up for my Affiliate Newsletter below so I can send you more promo tools and keep you notified of new product releases! Why The Demolisher Baseball Betting System? 1.) To help others make money - Everybody want to make money. The Demolisher Sports Betting System is one of the most unique money-making systems of its kind. Whether you're a gambler, sports enthusiast, or just any average Joe who wants to earn money doing what may possibly be the easiest job in the world, DemolisherBettingSystem.com is highly targeted for everybody from any walks of life as long as they simply want to make money for doing no more than minutes of work a day! 2.) Extraordinary conversion rate - Countless hours have been devoted to creating and perfecting the sales letter to ensure the highest conversion rate possible. All materials on the site are not only convincing, they are also true and genuine. As a result, visitors that you send to DemolisherBettingSystem.com will be highly convinced to purchase the product. This means more commissions for you! 3.) Thousands of genuine customer testimonials - The Demolisher Betting System has quite possibly the largest collection of genuine customer testimonials for any sports betting product ever sold on the internet! These testimonials serve as powerful social proof to convert your traffic into sales! 4.) 50% Commission On Every Sale! - When a visitor you refer to DemolisherBettingSystem.com ends up purchasing the product, you will receive 50% of the sale. That's approximately $100 commission per sale, on each and every sale! 5.) Get commission even if visitors don't take action on their first visit - The site keeps track of all visitors through cookies. This means that if a visitor doesn't make a purchase the first time around, you will still get the commission for the sale when the visitor returns and purchases it 30 days later (even without first going through your link). This is especially helpful when a potential customer signs up for the mailing list. Through the mailing list, potential customers are further incentivized to take action. Start Promoting The Demolisher System TODAY! Just replace "CLICKBANKID" with YOUR Clickbank ID (Username) and get paid 50% of every sale that you refer to the website! For example, if your Clickbank ID is johndoe123, then you will advertise this link: http://johndoe123.demsys.hop.clickbank.net That link will redirect the visitor to DemolisherBettingSystem.com. If the visitor ends up purchasing the product, you'll be credited with the referral, and be paid 50% of the sale! Click here (large file!) 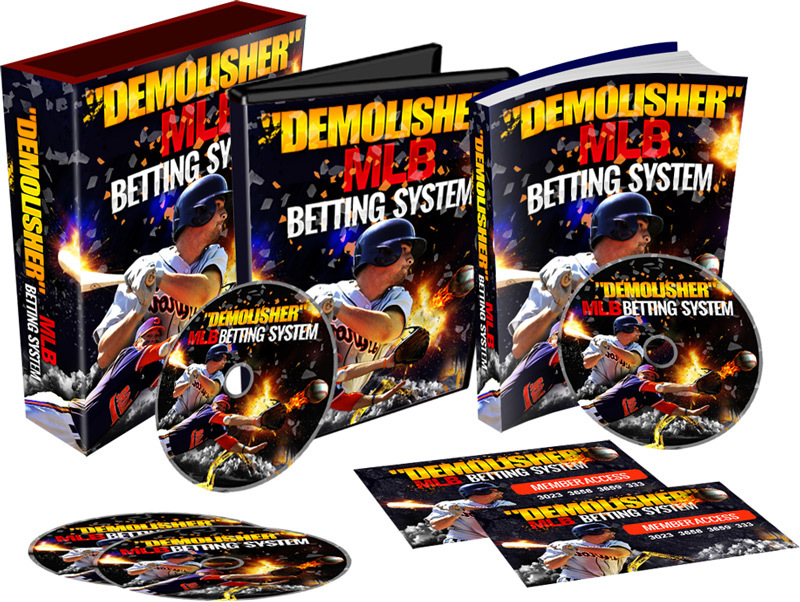 to download the Demolisher Baseball Betting System sales video. This includes the main 30-minute long video that autoplays when DemolisherBettingSystem.com is opened. Use the video in your own creative ways to promote the Demolisher betting system. This includes uploading the videos to your various video sharing channels such as your Youtube, Facebook, Instagram, or any other social media profile, include your affiliate link on the video and/or the video description. - Online Communities - Talk about the Demolisher Betting System in various online communities and marketplace channels such as Yahoo Answers, discussion forums, Craigslist, etc. - Videos - Create a video (or use one of the premade videos above) about the Demolisher Betting System and upload it to various video sharing channels such as Youtube, Vimeo, Dailymotion, Veoh, Metacafe, Break, etc. Include your affiliate link on the video and/or the video description. - Blogs - Talk about the Demolisher Betting System in your blogs at sites such as Wordpress, Blogger, and Tumblr. - Your Own Website - Advertise the Demolisher Betting System on your own website through text links or banners. - Pay-Per-Click Avertising - Advertise the Demolisher Betting System through various PPC programs. Instead of send people directly to DemolisherBettingSystem.com, it might be best to create your own landing page in which you talk informatively about sports and/or betting. Follow up by including your affiliate link at the bottom. - Email - Email your friends or anyone you know who may be interested in making extra cash. Include your affiliate link at the end of the email. You can also write an article on sports betting systems or sports betting tips, and include a link to the Demolisher Betting System at the end as a source for further reading. You're likely to receive better conversions if you'll put your visitors into pre-sold mood before sending them to DemolisherBettingSystem.com. This can be done by building interest in the betting systems through your landing page. This way, the visitor has already decided to potentially invest into the system after he/she reads your product review. Finally, please be mindful that you should be sincere and not misleading as an affiliate to the Demolisher Betting System. Make sure to be honest and about your recommendation, and state any affiliate connection relationship.